DUNE by Studio Roosegaarde is a public interactive landscape that interacts with human behavior. DUNE by Studio Roosegaarde is a public interactive landscape that interacts with human behavior. This hybrid of nature and technology is composed of large amounts of fibers that brighten according to the sounds and motion of passing visitors. This video shows an early prototype (Dune 4.0), developed as an artist in residence project at the Netherlands Media Art Institute in 2006. Commissioned by Netherlands Media Art Institute (Montevideo) Amsterdam, Rotterdam 2007 City of Architecture and CBK Rotterdam. Artist and architect Daan Roosegaarde (1979) explores the dawn of a new nature that is evolving from technological innovations by creating interactive landscapes that instinctively respond to sound and movement. Roosegaarde’s works function as a documentation of the dynamic relation between architecture, people, and technology. His sculptures, such as Dune and Intimacy, are tactile high-tech environments in which viewer and space become one. 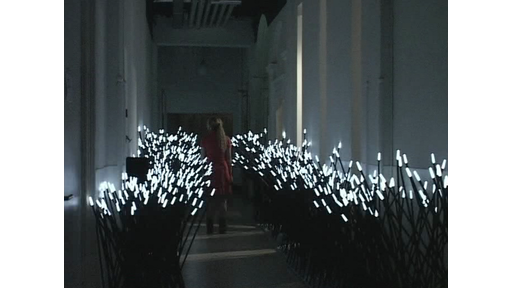 This connection, established between ideology and technology, results in what Roosegaarde calls “techno-poetry”. In 2009, Roosegaarde won the Dutch Design Award. He has been the focus of exhibitions at the Tate Modern, the National Museum in Tokyo, the Victoria and Albert Museum in London, and various public spaces in Rotterdam and Hong Kong.